This pendant is especially facetted by the Astrogems factory in India and is set in 9 Metal Gold. It is carefully shaped so that there is a smooth wide surface skin contact over the throat or heart chakra. Citrine represents Jupitor and prosperity it is a yellow quartz and each citrine is faultless. and of a deep yellow color. NINE METAL GOLD IS A COMPLEX ALLOY OF NINE METALS WITH THE PREDOMINANT ONE BEING COPPER. IT LOOKS LIKE GOLD AND OVER TIME WILL LOOK LIKE A PALE ROSE GOLD . BUT IF THE PERSON SWEATS A LOT ON IT . IT CAN LOSE ITS SHINE. THIS IS A VERY LARGE GEMSTONE PENDANT. PLEASE ANALYZE HOW BIG THE DIMENSIONS ARE. 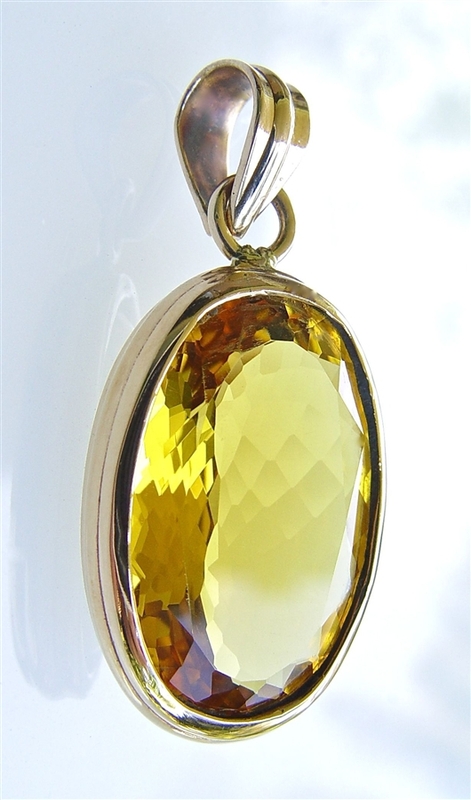 THE PENDANT DESIGN HAS BEEN SPECIALLY MADE SO THAT THE WEARER WILL GET THE BENEFICIAL ELECTRO-MAGNETIC RADIATIONS OF THE CITRINE GEMSTONES TOUCHING THE SKIN. If you want to strengthen the influence of Jupitor in your horoscope then this is a great way to do it. The citrine gemstone weights in the range of a whopping 35 to 40 carats . The dimensions of the citrine gemstone is 3 cm long, 2 cm wide - total length is 5 cm.